The addition of rooibos extract (RBE) (0%, 0.25%, 0.50%, 1.0% RBE) to improve the oxidative stability of blesbok, springbok and fallow deer droëwors (dried sausage) was studied. RBE treatments had no effects (p>0.05) on the lipid and protein oxidation of the dried product. With the addition of RBE 0.25%, lipid stability after drying showed the malonaldehydes decreased considerably. 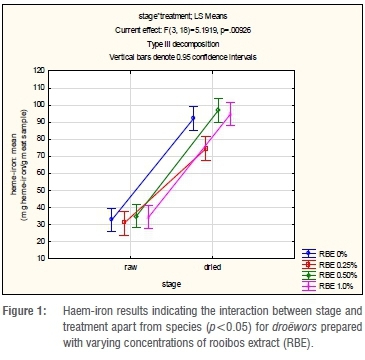 Haem-iron concentration increased after drying and differed (p<0.05) between RBE treatments within the dried stage within species. There were no differences (p>0.05) between the moisture, protein and fat contents between treatments within a specific processing stage. With the high polyunsaturated fatty acid content of the sausages, a high level of oxidation occurred. Even though RBE addition did not reduce oxidation significantly during the drying process, it could be a successful addition to the traditional South African meat product if it is shown to impart positive flavour attributes. Game meat is ideal for the production of droëwors as it is a lean meat with a low intramuscular fat content, has a favourable fatty acid profile and high iron content.1,4 Blesbok (Damaliscus pygargus phillipsi) and springbok (Antidorcas marsupialis) are harvested throughout southern Africa. They are both used in the production of biltong and droëwors. It is becoming more popular to harvest feral fallow deer (Dama dama) and as this meat could also be used in the production of droëwors, it would be of interest to evaluate the suitability of this species for droëwors. In commercial markets, synthetic and natural antioxidants are added to meat products. Butylated hydroxyanisole, butylated hydroxyl toluene, tertiary butylhydroquinone, sulphur dioxide and tocopherol are commonly added as a blend to enhance shelf-life via inhibition of oxidation.11 Consumers are more aware of the addition of synthetic antioxidants and therefore by replacing these with RBE, this should overcome the negative perception of some of the meat products currently sold in today's market. According to Liu et al.12 teas have been successful at low concentrations when used in combination with tocopherol to lower lipid oxidation. Research by Cullere et al.13 and Hoffman et al.14 suggests that the use of RBE at low concentrations could result in improved oxidative stability in meat products. The aim of this study is therefore to investigate the effect of the addition of different levels of rooibos tea extract as a natural antioxidant to blesbok, springbok and fallow deer droëwors regarding its chemical properties and oxidation levels after drying. Game meat of each species (blesbok, n=6; springbok, n = 6; and fallow deer, n = 3) was trimmed of all external fat and connective tissue and cut into approximately 100 mm x 100 mm cubes. No specific cuts were used. To increase the amount of fat in the product, sheep meat/fat (30 meat: 70 fat) was added. Three separate 36 kg replicates of droëwors from each species were made. Each 36 kg replicate was further divided into four treatment batches of 9 kg each. Each 9 kg batch consisted of 66.6% game meat and 33.3% sheep meat and fat. Each 9 kg batch was then combined with 1.5% (135 g) salt, 1% (90 g) pepper and varying amounts of powdered rooibos extract (RBE: 0%, 0.25%, 0.50% and 1.0% w/w concentrations) (Afriplex, Paarl, South Africa). The phenolic composition of the RBE used is depicted in Table 1. Each treatment batch was minced through a 10-mm grinder after which the spices (salt and pepper) and varying concentrations of RBE were added. The minced meat and spices were then mixed and minced through a 5-mm grinder. Natural sheep casings (22 mm diameter) were filled with the minced meat mixture. Half the sausage from each batch was dried in an environmentally controlled maturation chamber (Reich Unicontrol 2000S, Deli Spices, Cape Town, South Africa). Initially the sausage underwent a reddening stage at 30 °C with a 60% relative humidity for 15 min followed by a drying period of 48 h at a constant temperature of 30 °C and a relative humidity of 30%. The drying process took 2 days during which the droëwors lost 45-50% of its mass. The other half of the sausage was left raw for analyses. Fermented rooibos extract was used and prepared as per the procedure reported by Joubert et al.15 The phenolic composition of the rooibos extract (Table 1) was analysed according to the method of Beelders et al.16 through an optimised reversed phase liquid chromatographic (RP-LC) separation technique. To ensure a representative sample was tested, five replicate sub-samples (150-200 g) of both the raw and dried droëwors of each batch of droëwors were taken and individually homogenised in a blender for 3 min. The dried droëwors samples were taken within 30 min after the drying process was completed. The samples were stored in a -80 °C freezer until analysed. The homogenised samples were used for proximate analysis, fatty acid composition, haem-iron concentration, as well as for lipid and protein oxidation. Samples were analysed according to the Association of Official Analytical Chemists (AOAC) International to determine the moisture17 and ash18 content. The protein content was determined by multiplying the amount of nitrogen (N) by a factor of 6.25; N levels were determined by the Dumas combustion method as described in procedure 992.15 of the AOAC.19 Fat was determined using the chloroform/methanol (2:1) fat extraction method according to Lee et al.20 All analyses were performed in duplicate. The haem-iron concentration was determined according to the method of Hornsey22 as referred to by Hoffman et al.14 A 5 g homogenised sample was taken from each replicate and mixed with 1 mL distilled water, 20 mL acetone and 0.5 mL hydrochloric acid. Thereafter the flask was covered with parafilm and left in the dark overnight (±16 h). The sample was then filtered and the absorbance measured at 640 nm in a Cecil CE2021 2000 Series spectrophotometer (Lasec SA (Pty) Ltd, Durban, South Africa). The haem-iron concentration values were expressed in mg haem-iron per g sample. To test the effects of species, treatment and stage (raw or dried) on the various measurements, mixed model repeated measures analysis of variance (ANOVA) was used. The stage effect was within the subject repeated effect. For the mixed model, species, treatment and stage were treated as fixed effects and the batches to which the treatments were applied as a random effect. Fisher LSD post hoc tests were used to further analyse significant differences when the main effects/ interaction were significant. Statistical analyses were done using the VEPAC module of Statistica 11.25 A 5% significance level was used as guideline for determining significant differences. Results of moisture, protein, fat and ash content for each species of droëwors (blesbok, springbok and fallow deer) are presented in Table 2. There were no differences (p>0.05) amongst treatments but significant differences (p<0.05) between raw and dried stages. Therefore, the results indicate the proximate composition as averaged means of each species at a stage. The total fatty acid profile of each species droëwors with the various levels of RBE added are presented in Table 3. The fatty acids composition should be the same for each treatment within a batch at the raw stage as no changes would have occurred; therefore the raw samples were tested using the control (RBE 0%) sample for each batch for each species. After drying, the replicates of each treatment's batches were tested so that differences could be analysed. For each species, the same fatty acids were found, with the most prominent being oleic acid, stearic acid, linoleic acid and palmitic acid. As expected, the droëwors (irrespective of species) had a similar fatty acid profile to that of the sheep fat added. 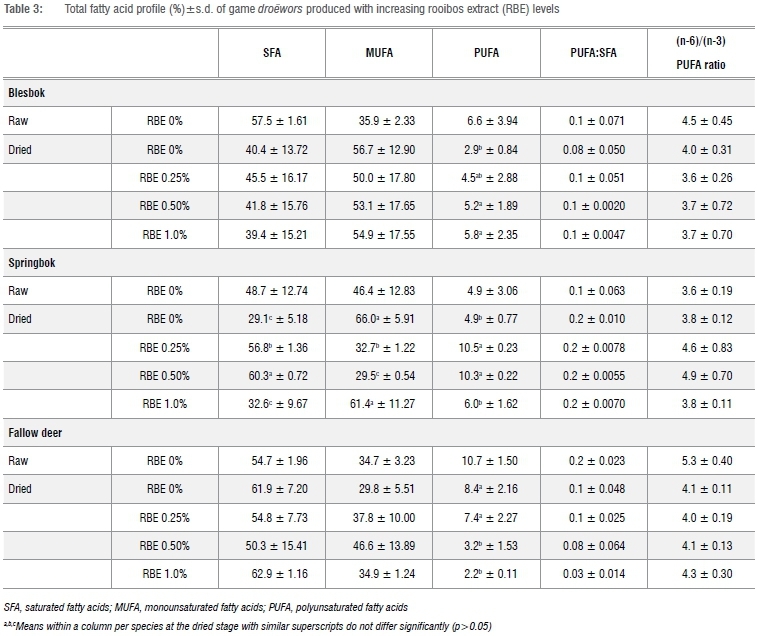 There were differences (p<0.05) in the total polyunsaturated fatty acid (PUFA) profiles between the treatments of each of the species' droëwors after the drying process. When analysing the blesbok species droëwors (Table 3), the PUFA values increased with increasing concentration of RBE. Springbok species droëwors (Table 3) did not follow a distinctive trend with the addition of the RBE; springbok with RBE 0.25% and RBE 0.50% had increased PUFA values whilst the other treatments both had similar percentages, which are also similar to that of the raw samples. With the fallow deer species droëwors (Table 3), the opposite trend to that of the blesbok species droëwors occurred; the PUFA values decreased with increasing RBE concentration. The mean values for the haem-iron concentration in the droëwors samples are depicted in Table 4. The treatments of blesbok and springbok species droëwors had similar initial haem-iron concentrations that increased after drying. Furthermore, after drying all treatments had similar haem-iron concentrations over all species types. Meat with RBE 0.25% had lower (p<0.05) haem-iron concentrations after drying for all species as noted in Table 4 and Figure 1. There were no significant differences between the species (p=0.685), therefore it would be acceptable to analyse the interaction (p=0.00926) between stage and treatment regardless of species, as seen in Figure 1. RBE 0.25% therefore had the lowest increase, which corresponds with the results of lipid oxidation given in Table 5. Although it was expected that the haem-iron would differ between raw and dry droëwors, when expressed on a dry mass basis, the droëwors still had higher haem-iron than the raw droëwors (Table 4). Lipid oxidation results for blesbok, springbok and fallow deer droëwors are depicted in Table 5. The results for each species differed significantly from each other (p=0.0231). It is important to note that as droëwors is a dried meat product, it is expected to undergo a large level of oxidation and therefore the TBARS values are expected to be higher than those found in raw meat. Therefore, the results are compared across treatments rather than between raw and dried samples. Blesbok species droëwors showed a general trend that after drying, each treatment had increased TBARS values, although the results also indicate that RBE 0.25% resulted in the lowest lipid oxidation and haem-iron concentration (Table 4) in blesbok species droëwors. The mean values for springbok species droëwors indicate that the TBARS values of the RBE-treated samples (0%, 0.25% and 0.50%) all increased with drying. RBE 1.0% decreases slightly (0.52 MDA per kg meat sample difference). As with the blesbok species droëwors, these results indicate that RBE 0.25% gave the best results in terms of minimum lipid oxidation. Fallow deer species droëwors mean values differed slightly from blesbok and springbok species droëwors, although the MDA levels fall within the same range as the blesbok and springbok droëwors of both the raw and dried stages, except that the best result is shown to be at RBE 1.0%. The addition of RBE to droëwors did not result in significant differences (p>0.05) between treatments after drying within a species. There were significant differences (p=0.0132) in protein oxidation in terms of the two stages, raw and dried, which was expected as during drying, protein oxidation will occur (Figure 2). However, each treatment did not always result in an increase in carbonyls. When evaluating the species individually within a stage, the fallow deer species droëwors carbonyl levels decreased after drying (Figure 2). 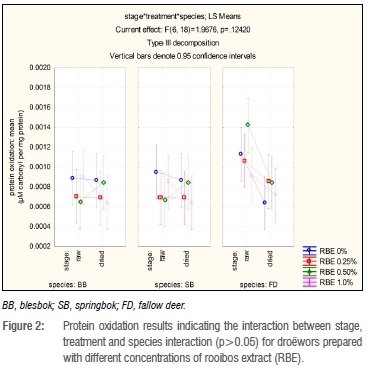 Blesbok and springbok species droëwors followed the same trends for each treatment, staying at a constant for RBE 0% and 0.25%, increasing for RBE 0.50% and decreasing for RBE 1.0%. As seen in Figure 2, there were visible differences between the species; mainly that of the fallow deer species droëwors in comparison with both blesbok and springbok species droëwors. When evaluating within species, protein oxidation in blesbok species droëwors samples remained fairly constant with the addition of RBE 0% and 0.25% with mean values (expressed as μΜ carbonyl per mg protein) of 0.00089 (raw); 0.00087 (dried) and 0.00070 (raw), 0.00069 (dried) respectively (Figure 2). The protein oxidation in samples with the addition of RBE 0.50% increased over time from 0.00065-0.00085 μΜ carbonyl/mg protein. The samples with RBE 1.0% decreased in carbonyls by 0.00026 μΜ carbonyl/mg protein which is a very small (not significant) amount. Springbok species droëwors samples indicate similar results to blesbok species droëwors samples in that with the addition of RBE 0.25%, the protein oxidation products remained fairly equal over time with mean values (μΜ carbonyl/mg protein) of 0.00069 (raw) and 0.00069 (dried). Samples with RBE 0.50% again increased after drying by 0.00018 μΜ carbonyl/mg protein, whilst RBE 0% and RBE 1.0% decreased by 0.000085 μΜ carbonyl/mg protein and 0.00021 μΜ carbonyl/mg protein. All treatments of the fallow deer species droëwors samples decreased after drying with an initial average mean value of 0.0035 μΜ carbonyl/mg protein and 0.00076 μΜ carbonyl/mg protein average mean values after drying. The differences between these values were not significant. There were no significant differences amongst the treatments at each stage (raw and dried) for the individual species. The proximate composition results indicated that the moisture lowered after drying by approximately 50% which was expected as the droëwors, as per the procedure used, was dried to lose 45-50% of its original mass. Because of the moisture loss after drying, the protein and fat content was expected to become more concentrated.26 With the moisture loss experienced during the drying process, as expected, the concentration of fat in the droëwors doubled (Table 2). The increase in concentration of the ash content with the drying can be explained by the drying process although it must be kept in mind that the higher than expected ash content would also be because of the added spices. The fatty acid profile showed that the saturated fatty acids (SFA) initially made up approximately 50-60% of the sausages' total fatty acids. This was caused by the addition of sheep meat/fat to the lean game meat species. Sheep fat is high in stearic acid which contributes to the high total saturated fatty acid of the droëwors. The total unsaturated fatty acids made up the remaining 40-50% of the fatty profile. After drying, the fatty acid profile of the droëwors was expected to change because of oxidation; however, if the RBE functioned as an antioxidant, it was expected that the fatty acid profile would also differ in terms of percentage fatty acids between treatments within species. However, there were no significant differences between the PUFA values of the blesbok droëwors which would seem to indicate that the RBE did not function as an antioxidant. The fatty acid profile, especially that of the low PUFA, at treatments RBE 0% and RBE 1.0% of the dried springbok species droëwors (Table 3), would seem to indicate that more oxidation may have occurred at these concentrations. Fallow deer droëwors' PUFA decreased with increasing concentrations of RBE, which would indicate that there was increased oxidation with increasing RBE levels. The haem-iron levels, lipid oxidation and protein oxidation need to be discussed in conjunction with each other for an accurate conclusion to be made as haem-iron and oxidation are closely related to each other.27 Haem-iron is a catalyst for lipid oxidation, therefore the higher the haem-iron content, the more susceptible the product is to oxidation.27 Protein oxidation products are also known to induce lipid oxidation as the protein oxidation products react with free lipid radicals resulting in increased lipid oxidation.28 Lipid oxidation however may also initiate protein oxidation.29 A standard Pearson's correlation indicated that the haem-iron was positively linked to the TBARS of the dried droëwors in all the species (blesbok 0.52, springbok 0.24, fallow deer 0.86). Haem-iron increases after drying which could be from moisture loss of the product. However, the possibility exists that the haem-iron is not released from the porphyrin ring because of the drying process. The principle that is followed involves the interaction between lipid and protein oxidation which subsequently results in lowered haem-iron values. Lipid oxidation occurs through a free radical chain reaction whereby oxygen is the most important factor in the development of lipid oxidation in meat and meat products.37 Droëwors is a processed dried meat product and the process includes a mincing step. The mincing of the meat disrupts the cell membranes releasing pro-oxidants naturally found in meat which interact with the PUFA in the presence of oxygen and reactive oxygen species. This initiates lipid oxidation.38 Lipid oxidation products include superoxide anions and hydrogen atoms which react to form hydrogen peroxide (H2O2). H2O2 acts as an oxidising agent by releasing the haem-iron molecule (via oxidative cleavage of the porphyrin ring) resulting in further lipid oxidation.12,37,39,40 At this point however, if the antioxidants have bound to the binding sites of the myoglobin molecule in which the haem-iron is attached, this will be prevented. This process, called the Fenton reaction, is also involved in the reduction of PUFA. At slaughter, reducing enzymes in meat are depleted, resulting in the accumulation of metmyoglobin. Metmyoglobin consists of haem-iron in its ferric state (Fe3+), which has two binding sites.37 RBE is made up of polyphenols,41 therefore it can be speculated that they will attach to these binding sites of metmyoglobin, which primarily bind oxygen. With the RBE binding to these sites, a decrease in myoglobin oxidation occurs because oxygen cannot bind to the same sites. As the protein oxidation is a metal-ion catalysed reaction, there is a decrease in protein oxidation thereby decreasing lipid oxidation via protein oxidation products. Aspalathin is unique to rooibos tea.9,41 It acts as a potent antioxidant at low concentrations and a pro-oxidant at high concentrations. As an antioxidant, it has a radical scavenging ability which protects against oxidative damage. Plant antioxidants added to meat and meat products have beneficial effects for protection against excessive oxidative damage induced by reactive oxygen species.42 High concentrations of total flavonoids, dihydrochalcones (aspalathin and nothofagin) and/or total polyphenols are a few reasons why RBE could also act as a pro-oxidant.41 Assays have been demonstrated using RBE to inhibit lipid peroxidation which concludes that its efficacy is dependent on the total polyphenol content rather than the individual flavonoids.10,41 However, the RBE used in this study had high concentrations of aspalathin and quercetin (Table 1) which can both have pro-oxidant properties when added in high concentrations, which could explain the increased lipid oxidation values with the addition of RBE 0.50% and 1.0%. 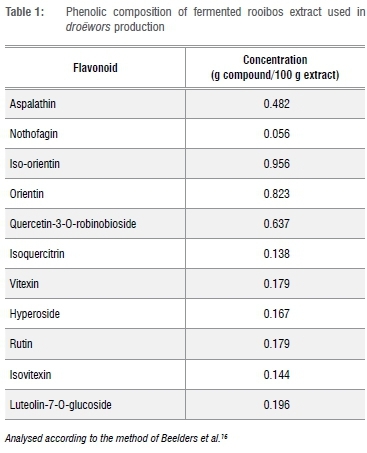 Orientin and iso-orientin (analogues of aspalathin) could also play a role in the pro-oxidant effect of the rBe as these flavonoids are also found in high concentrations41 (Table 1). The low results for haem-iron and lipid oxidation at RBE 0.25% are because of the inhibition of haem-iron release via the binding of the antioxidant to its binding sites, which inhibits protein oxidation and in turn minimises the level of lipid oxidation. Lipid oxidation does occur to some extent because of the initiation of lipid oxidation during processing. Only with the addition of RBE 0.25% did this occur. The same trend was seen over all species. These results also relate to the protein oxidation results which show a minimal formation of carbonyls. With the addition of higher concentrations of RBE, this resulted in higher oxidation levels. This could be the result of the saturation of the binding sites of haem-iron. Once these sites have been saturated, the RBE begins to act as a pro-oxidant as it has a high total polyphenol content and plays a role in the generation of hydroxide (OH-), which is a reactive oxygen species. Therefore, the more RBE present, the higher the level of oxidation that will occur. It can therefore be proposed that the addition of RBE 0.25% would be the threshold for usage as an antioxidant in droëwors. The control (RBE 0%) proved to have similar oxidation results as those of the RBE at high concentrations. Both blesbok and springbok species droëwors showed that the addition of RBE 0.25% tended to slow down lipid oxidation. The addition of higher concentrations of RBE (0.50% and 1.0%) did not give expected results as oxidation activity was higher than the control (RBE 0%). Fallow deer species droëwors resulted in high oxidation activity with the addition of RBE at 0.25% but this does not correspond with the other species droëwors as the addition of RBE 1.0% gave the best results in terms of inhibition of oxidation activity after drying. This could be because of the chemical composition of the fallow deer differing from that of the other two species; an aspect that warrants further research. Although the results obtained from this study did not prove the inhibition of lipid oxidation to be significant, there were some interesting trends observed. Lipid and protein oxidation showed that the addition of RBE at 0.25% gave the best results. Haem-iron concentrations after drying showed significant differences with RBE 0.25% resulting in a low haem-iron content in comparison with the higher RBE concentrations. Though the differences for lipid oxidation weren't significant, it is important to note that RBE 0.50% and 1.0% gave higher oxidation results but that these MDA values were never higher than the control MDA values. As some results were inconsistent across species, this indicates that species type (especially with the fallow deer droëwors) and formulation of the droëwors play an important role in the antioxidant activity of the added RBE. The fatty acid profile had high concentrations of oleic acid, stearic acid, linoleic acid and palmitic acid in both the raw and dry droëwors samples which is consistent with the sheep fat added. The high polyunsaturated fatty acids resulted in a higher oxidative activity as noted. The formulation used contains a high fat content of 33.3%. By reducing the fat content and re-formulating the droëwors recipe, this should allow for an improved fatty acid profile, as the droëwors tends to be more similar to the added fat. A sensory panel analyses should also be conducted to determine whether the oxidation is detectable and to give an indication on whether RBE will impart a specific flavour to the droëwors. This work is based on research supported by the South African Research Chairs Initiative of the Department of Science and Technology and National Research Foundation (NRF) of South Africa. Any opinion, finding and conclusion or recommendation expressed in this material is that of the authors and the NRF does not accept any liability in this regard. We thank the students and technical staff of the Department of Animal Sciences at Stellenbosch University for their assistance and support. Afriplex (Pty) Ltd, Paarl supplied the RBTE. L.C.H. was the project leader and contributed to the manuscript; M.J performed the experimental work (both chemical and sensory work) and wrote the manuscript; and M.M. contributed to the sensory experimental design and manuscript.